Unicorn party fun with our inflatable Unicorn ride hire. We offer two different Unicorn Rides for hire for parties and special occasions across the central area of the UK. 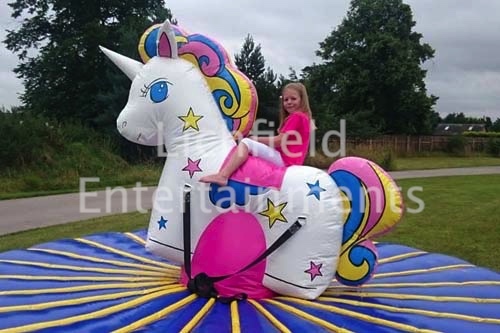 The all inflatable version for younger riders and the motorised Unicorn Rodeo Ride for ages 7-adult. If you're holding a party for any young Unicorn fan then we have the perfect party entertainment with our brilliant inflatable Unicorn ride. Almost as rare as real Unicorns as far we know there's only a handful of these available in the whole of the UK. Suitable for riders up to 40kg in weight this ride is all inflatable and is rocked back and forth and side to side by others pulling on the tug straps until the ride has had enough or falls on to the soft mattress below. The Unicorn ride needs an overall operating area of 20x20ft and this needs to be a flat and level area. If the ride is going outdoors we can provide an inflatable shelter to go over the top for a small additional charge but that increases the area required to 23x23ft. This is a Unicorn version of the rodeo bull ride that we had specially made for us. This motorised ride will spin and buck under the control of the trained operator with the speed fully adjustable. This Unicorn ride has a minimum rider height of 4ft so in practice this generally works out to around age 6-7 and it's suitable right the way up to adults weighing a maximum of 17 stone. The ride requires an operating area of 18x17ft with a height clearance of 9ft if indoors. If outdoors you need 23x23ft as we provide an inflatable cover to go over it. If you have any queries, questions, or would like to book one of the Unicorn rides for your party please call us on the number below or click to enquire and we will do all we can to help.